Pretty Little Nails:): Wet'n'wild Fergie LE A009 Hollywood Walk of Fame. 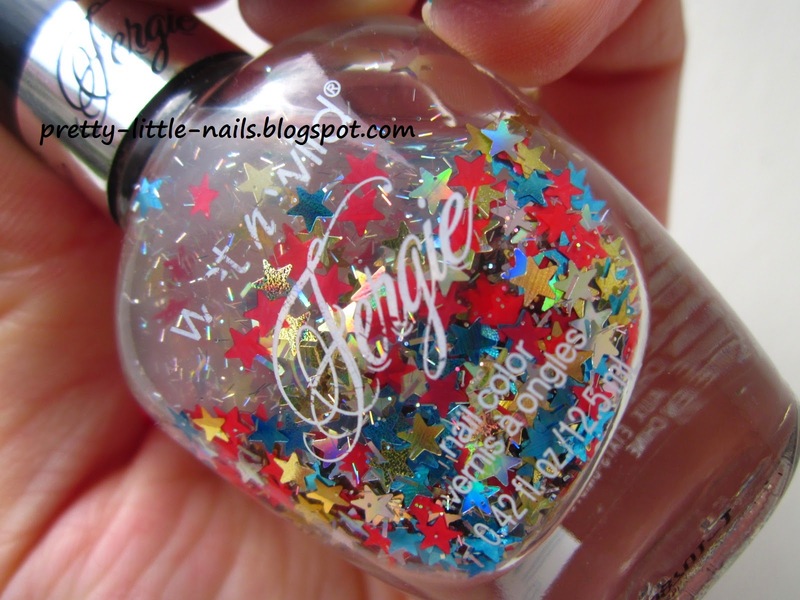 Wet'n'wild Fergie LE Hollywood Walk of Fame has star shaped glitters and tiny speckles in different colors in clear polish. It looks really nice but only in the bottle. It's almost impossible to get the stars off the brush (and what's more they stick to the opening of the bottle when you try to take the brush out). You also need a lot of top coat because the stars fall off really fast and they don't stick too well (and I destoyed my pantyhose because of it:/). I removed this polish in less than few hours and I don't think I'm gonna use it again. The base color is (I never used it before) Rimmel 60 seconds 825 Sky High - it looks totally different in real life, it's more blue. I can say, this manicure's totally disaster! Nie wiem po co go w ogóle kupowałam, bo wiedziałam, że zbyt praktyczny to on nie jest. Ale po użyciu rozczarowałam się jeszcze bardziej - nie da się nałożyć tych gwiazdek, przyklejają się do buteleczki, zahaczają o praktycznie wszystko, a przez to szybko odpadają. Oh too bad! The polish does look really pretty in the bottle so it's a shame it's not like that in real life - that's always such a dissapointment when polishes don't turn out the way you expected! Very happy glitter, love the combo!